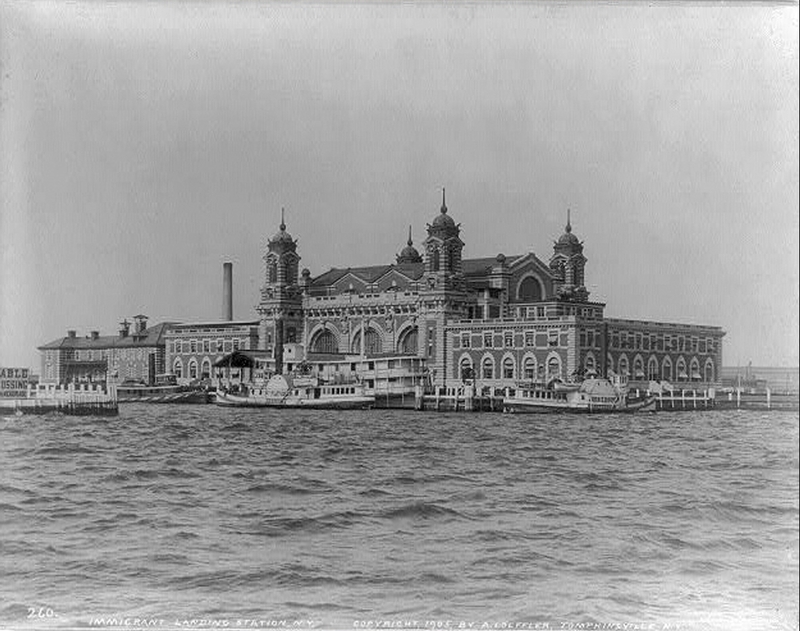 Until 1954 most immigrants arriving in the United States went through the immigration inspection station on Ellis Island in Upper New York Bay. Having travelled across Europe, often on foot, carrying your few precious belongings in a small wicker suitcase, you’d board a ship to cross the rough waters of the Atlantic. After weeks at sea you’d see the Statue of Liberty and weep with joy, thinking you’d arrived. 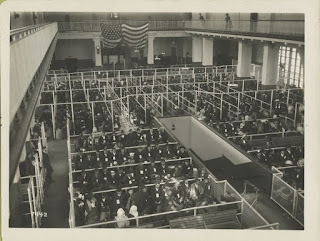 But first you had to get past the immigration officials at Ellis Island. Those who travelled in first and second class were given a cursory check on board. It was assumed that they had the wherewithal to support themselves and were in relatively good health and would not be a burden on their new country. But those in third class were transported by ferry to the immigration station. There you left your wicker suitcase in a giant pile downstairs - where it was often stolen, so you ended up with nothing, not even your few small belongings - while you lined up for hours upstairs. First you had to undergo a medical inspection. If you were found to have ‘mental defects’ or be carrying a contagious disease like TB you had a cross chalked on your forehead and were put on the next ship back. Then came interrogation, to find out who you were and check that you had no criminal record and enough money or relatives or a trade to support yourself. 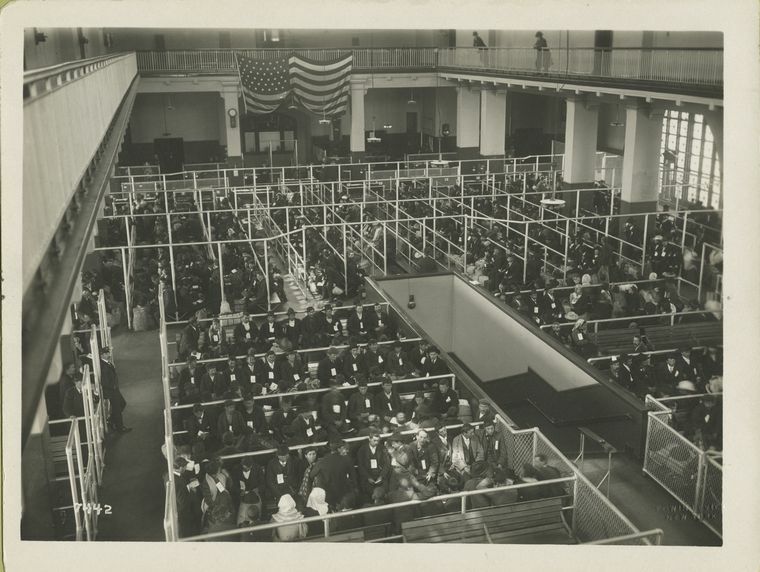 With five thousand immigrants filing through each day, the inspectors had a bare two minutes with each person which meant they often got the immigrant’s name and sometimes even their country of origin wrong. It was a chance to reinvent yourself, give yourself a name like ‘Smith’ instead of a name that gave away your East European roots. Of the immigrants who made it through, the vast majority of those who stayed in New York ended up in the cramped, poorly lit, unsanitary tenements of the Lower East Side. First to arrive were Germans and East European Jews in the late 19th Century, followed by Italians in the early 20th century, together with Greeks, Hungarians, Poles, Romanians, Russians and Ukrainians, each of whom settled in separate enclaves, crammed into tall skinny Dickensian buildings with fire escapes zigzagging up the fronts. It was a sort of Babel, a pot pourri of people all speaking different languages. 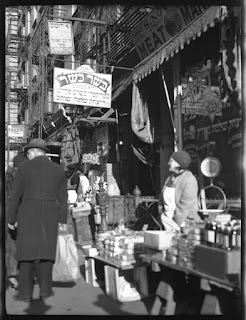 The Marx Brothers grew up in the neighbourhood and so did Al Johnson, Gershwin and Irving Berlin, and as for the East Village, the northern part of the Lower East Side, it later became a hub for artists. I identify very much with this story. Nowadays ‘multiculturalism’ is a term much bandied about and it’s fashionable to discuss one’s roots and to be proud of being of mixed racial heritage. But in the 1950s and 60s, the suburb of London were I grew up was entirely Anglo-Saxon and most families had been there for generations. Mine was the only immigrant, mixed race, nuclear family. My parents were Canadian and my mother was Chinese - an immigrant twice over. When my father’s student friends saw a photograph of her on his mantelpiece before she came over, they told him in no uncertain terms to find a nice English girl to marry. I always felt a little different from everyone else. In 1991, when I first went to New York, I found myself in a place where everyone had a story. Everyone’s family had come from somewhere else not that many generations back and everyone was interested in my story whereas back in England even in those days it was still unusual, even weird, to have a family story to tell. I felt immediately at home. I stayed with my friend Kim in Brooklyn. In 1991 New York was still considered a rough place. Kim gave me a map and marked the areas to avoid, prime among them being the Lower East Side and the mean streets of Alphabet City. In the 1980s she and her boyfriend had lived in the East Village. There’d been only one toilet, shared with the other apartments on her floor, and they’d had to heat up water to bathe in a tub in the kitchen. Once they were at home when they heard a loud bang which seemed to be right inside the room. They looked around, wondering what had happened. Then they spotted dust seeping from a hole in the wall just above Kim’s head. There was a bullet embedded in the wall opposite. It had come through from the next apartment. For me it was the beginning of a love affair. I’ve been back pretty much every year since then and lived there for two years at the end of the nineties in a sublet near Washington Square. Nowadays I go once or twice a year with my American husband. We quickly discovered that the East Village and the Lower East Side were the most interesting places to stay. Five or six few years ago we took a sublet in the East Village, on 7th Street between Avenues A and B, opposite Tomkins Park, where as late as the 1980s and 90s there was an ongoing turf war between heroin dealers, gangs and police. The homeless lined up outside the park every day waiting for the trucks that brought them meals and at night we’d hear people going through the dustbins outside our apartment. We went to a gallery opening in Orchard Street deep in the Lower East Side. The area still looked forbidding, dark and grimy, with a few galleries and the occasional restaurant tucked among shops offering cheap leather goods and suitcases. Since then the area has changed in leaps and bounds. It feels like a privilege to have the chance to see it while it’s still in the process of transformation, before it becomes set and - perish the thought - full of expensive boutiques like SoHo or staid and middle aged like the Upper West Side, both of which were in their time edgy places. This year we stayed at the bottom rim of the Lower East Side, where it meets Chinatown. Much of the area retains its old character. It’s still edgy, still being formed. It still feels rough. The tenements are still there with their iconic fire escapes. What makes the place so wonderful is the contrasts. There are still old men spitting on the sidewalks, women pushing carts of vegetables and groups of youths hanging around looking threatening. There are leather goods shops, Chinese laundries, corner grocery stores, flower shops, Chinese vegetable shops with no English translations on the store front, fish shops, a fish market, suitcase shops, clothes shops. But right alongside are restaurants, galleries, nail spas, massage parlours, shops offering Ayurvedic massage and a pharmacy advertising matcha smoothies directly across the road from a Chinese laundry. Even the trendy restaurant Forgtmenot (sic) has scaffolding outside with a sign saying it’s a hardware store. At first sight it looks like a building site. And now hotels are arriving with a vengeance. First came the Hotel on Rivington. This year there are several new hotels, such as the Blue Moon, a four star hotel on Orchard Street (which still seems like an oxymoron), and the glossy Orchard Street Hotel. The latest big opening was for Ian Schrager’s Public, a shiny new building at the top of Chrystie Street where non-hotel guests have to wait in a dark tunnel to be vetted before they can take the lift to the bar on the 18th floor. There’s even a movie theatre. You walk down Ludlow Street past several Chinese laundries and a ramshackle Chinese grocery and suddenly come to a blank facade. Push open the door and you find yourself in Metrograph, a sleek cinema complex styled after 1940s Hollywood, showing old films, with an excellent restaurant upstairs. Appropriately it was having a Chinatown season when we were there. One minute you’re in quite a rough grimy street, the next in this very sleek restaurant. Catch it while you can. For a lover of history it’s an amazing place to be. You can actually track the process of change, see history in the making. 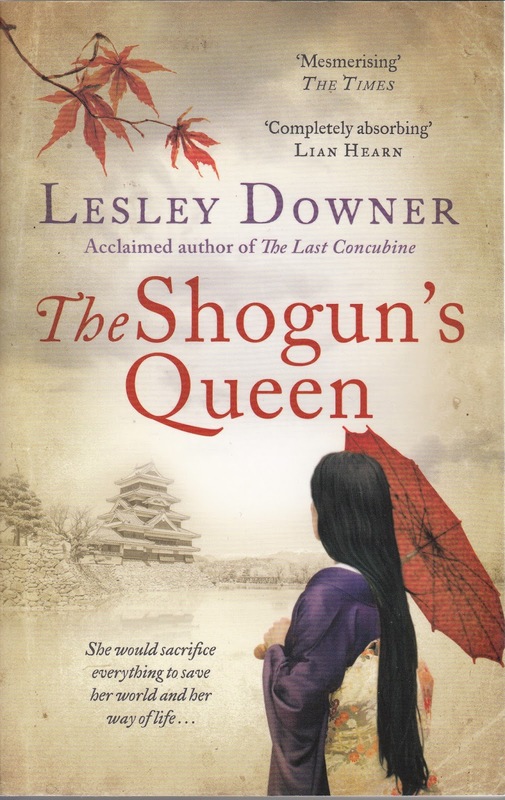 Lesley Downer’s latest novel, The Shogun’s Queen, an epic tale set in nineteenth century Japan, is out now in paperback. For more see www.lesleydowner.com/.